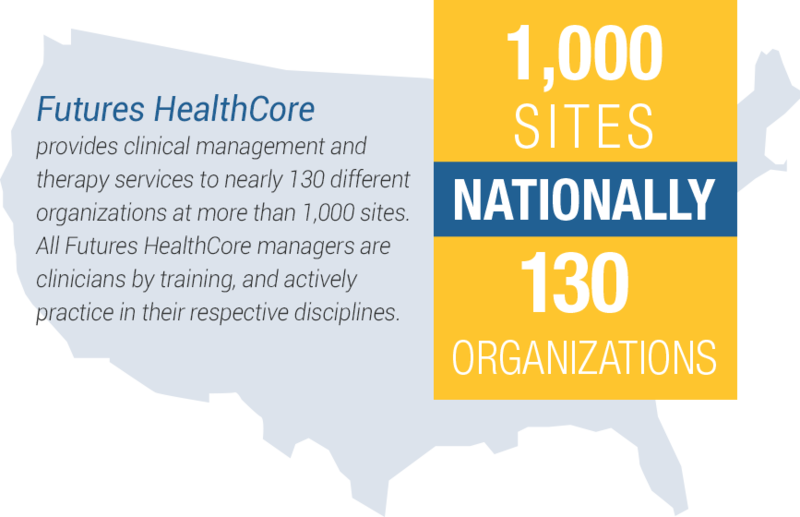 Futures HealthCore provides clinical staffing and management services, program development and service coordination supports to people of all ages with developmental disabilities. We provide nursing, nutrition, speech and language therapy and physical and occupational therapy in a collaborate effort with our partners to meet the needs of developmentally delayed individuals in a variety of living and program situations. Access to experienced, diverse, and responsive professionals with a demonstrated track record of delivering outstanding results and resources. Best practices for clinical programs with top consideration given to design, delivery, management and accountability. Cost controls while maintaining outstanding services to clients. Practical and timely communications including caseload management reports, individualized statistical analyses, and quality assurance reviews. Futures HealthCore provides services at its own therapy clinics and in client’s own homes as well as community service agencies, and healthcare facilities for the pediatric treatment of children from infancy to 18 years of age diagnosed with autism spectrum disorders, cerebral palsy, developmental delays, articulation difficulties, ADD/ADHD, brain injury, Down syndrome, and sensory integration dysfunction. 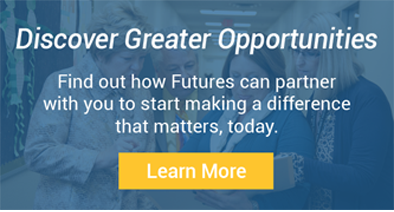 Futures HealthCore offers custom solutions for skilled nursing facilities and other healthcare settings providing delivery and management of cost effective rehabilitation services in compliance with the Medicare Prospective Payment System. Before my daughter started working with (the occupational therapist from Futures), we could not find an OT willing or able to deal with her complicated case. My daughter has made gains working with the Futures OT – an expert in Sensory Integration Disorder who uses a very comprehensive and creative approach in each session. I know that she has made a huge difference in my daughter’s life.